Some CRPF vehicles with soldiers were attacked by a stone pelting jihadi mob in Srinagar yesterday. In the videos and images that emerged later, it was seen that a large mob of several dozen stone pelting jihadis were attacking CRPF vehicles passing through a street in Nowhatta area in Srinagar. Images of the brutal attack were harrowing and showed how vicious a jihadi mob can be. 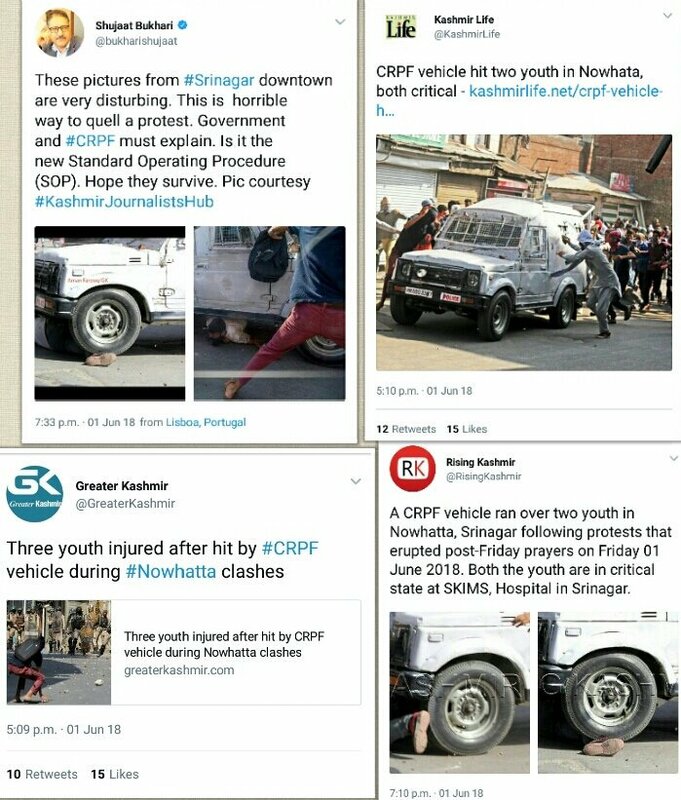 As expected by Rahul Pandita in his tweet soon other images which quite conspicuously cut out the jihad mob attacking the vehicle but showed only a person being run over by a vehicle amidst all that commotion was being peddled by apologists. Kashmiri local news outlets and many individuals circulated zoomed, selective versions of the images and tried berated the security forces for the “shameful anti-insurgency tactics”. As seen, the brutal stone pelting was painted as CRPF vehicles mowing down Kashmiri youth who were returning from Friday prayers. But as predicted, the lies and manipulation of facts were quite evident. Not being content at the mere distortion of facts, some even tried to indulged in whataboutery in their desperate attempt to exonerate the murderous, stone pelting mob, in the ‘misguided youth’ format. 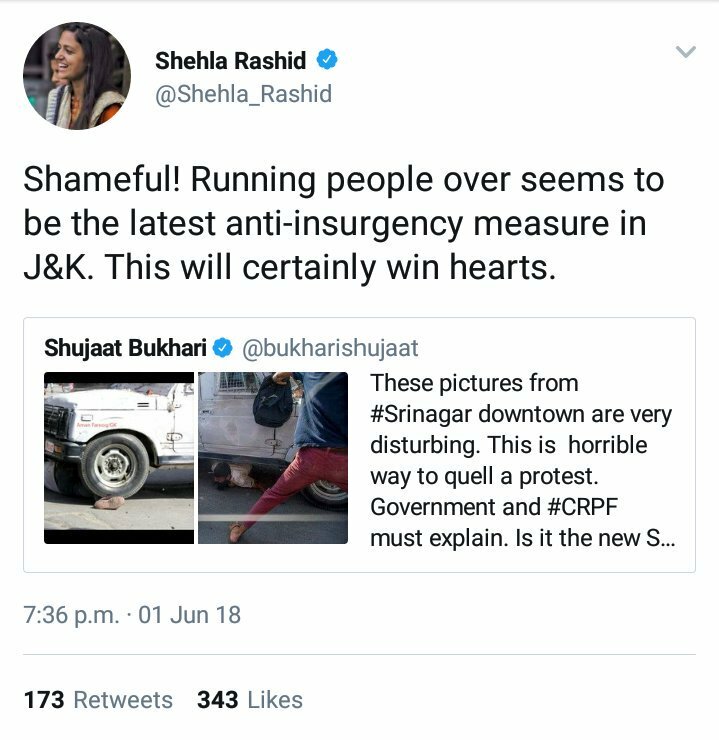 The Jammu and Kashmir police also tweeted shaming the selective reportage. If there is anything more shameful than an Islamist mob pouring over security forces vehicles with bricks and stones, it is the blatant propaganda certain elements peddle to absolve them of any wrongdoing. The way Major Gogoi was hounded and vilified by media and their cohorts after his action that led to saving a group of officials from a much larger mob ready to pelt stones was also another testimony of the extent a terror apologist mind can go. Media is always prone to fake news and misrepresentation, but there is a vast difference between misrepresentation of facts and deliberately using selective narrative to malign the security forces and totally ignoring the Islamist mobs that attack them.